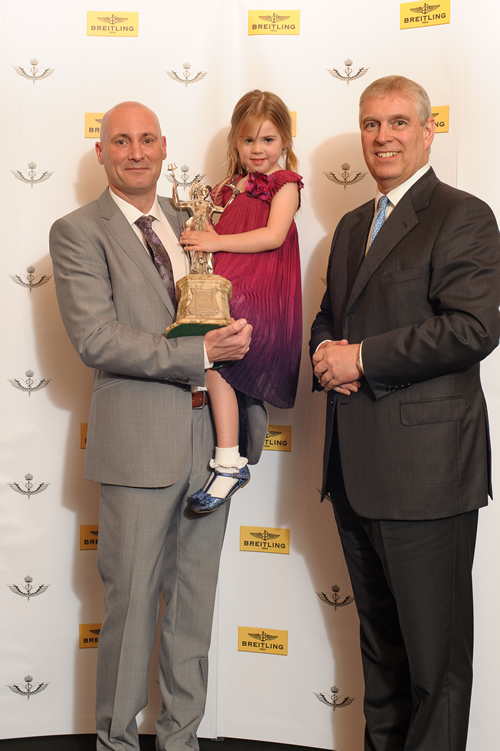 The Royal Aero Club's Britannia Trophy was awarded to Jon Hilton and his daughter by Prince Andrew, the Duke of York, in May 2014 at the RAF Club Picadilly. Jon gets embarrassed by this type of thing but we've taken the liberty of adding this picture as we're quite proud of his achievements. Hopefully his book, "Decision Height" will be available to read sometime, when he gets around to finishing it. The award was presented to Jon by the Duke of York, on the 13th May, at the RAF Club in Piccadilly, London. When asked about the evening Jon said, "Prince Andrew seemed like a very nice chap and hopefully Ava will cherish the pictures for the rest of her life. A great day out." Jon went on to say that he bought the suit solely for that evening and (as he'd vowed never to wear one again) that it was available to buy if anyone wanted to purchase it !